Las Vegas is a city located in Nevada's Mojave Desert. Las Vegas is famous for its vibrant nightlife, entertainment, big mansions, hostels, etc. but moreover that this city is renowned for casinos. 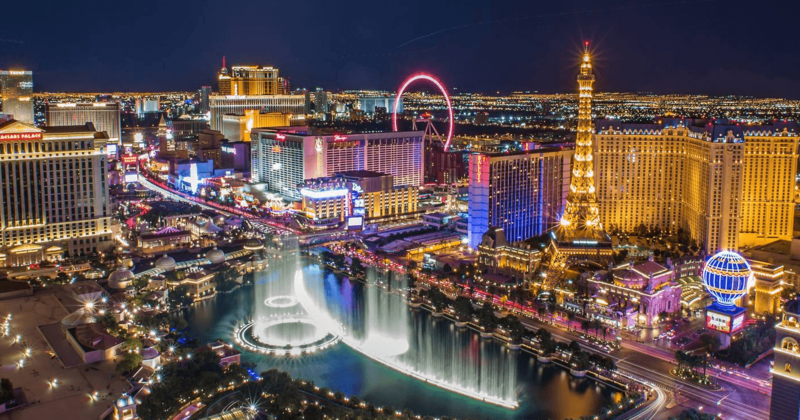 This city was founded in 1905 and till date has a population of 640,174, but the interesting fact is that every year around 42,300,000 visitors visit Las Vegas for entertainment and for gambling. This city has about $1.1B of downtown gaming revenue which is highest as compared to any other cities. The world of casino billionaires is a tiny one. And as we know with gambling being illegal in most parts of the world, the gaming properties of the world’s wealthiest are often directly competing with each other. Because of this, owners use many strategies to attract more customers towards them. They take all kinds of risk involving large sums of money just to make a profit, and this profit is not a few dollars but millions of dollar. Gambling is fun, but it's not just about gaming as many people visit casinos for shopping, dining or a getaway. So many owners offer customers with a better deal like discounts or free trial membership and keep their place running in the competition. Also, they concentrate on the younger part of the population as they are a long-term investment and can bring business over their lifetime. Live events are hosted for marketing purpose because this allows the owners to have a face to face talk with their customers which help in building trust and eventually a better future for their casino. This casino was started on August 5, 1996, and is owned by Vici Properties. This casino has a beautiful theme based on the Roman Empire. The signature attraction is Replicas of ancient Roman, Greek and Renaissance. Permanent shows carried out are Absinthe. Also, Caesars Palace has a total gaming space of 124, 181 square feet and the hotel has also operated as a host for live music and sports entertainment. Also, they are holding boxing matches since late 1970's and has also hosted the Caesars Palace Grand Prix from 1981 to 1982. The yearly revenue for Caesars Palace casino is US$ 4.85billion. This casino was started on December 16, 2009, and is own by MGM Resorts International and Infinity World Development. Sage, Julian Serrano, Bar Masa, Jean Georges are some famous restaurants, and the signature attraction is Aria Art Collection. The total revenue for Aria in 2017 was $2602 billion. Also is the largest hotel in the world which has earned LEED Gold certificate for a reduction in energy consumption. Aria has a total 150,000 square feet of gaming space and 215,000 square feet of the pool area with 80,000 square feet of salon and spa. Bellagio was founded on October 15, 1998, and is owned by MGM Resorts International. The notable restaurants are Le Cirque, Circo, Harvest by Roy Ellamar, Picasso, etc. This casino has a total gaming space of 116,000 square ft. And made a total of $93.5 million in cash flow for the three months ending March 31, and made a record of highest profit ever in Las Vegas. Many professional poker players prefer to play at the Bellagio poker room, and that is why it is also called the home base or commonly "The Office". The stakes at the big game can range up to $4,000/ $8,000. MGM Grand was founded on December 18, 1993, and is owned by MGM Resorts International. This grand casino has a signature attraction called as the MGM Grand Garden Arena Hakkasan. MGM Grand has 171,500 square feet of gaming space and has annual revenue of $10.77US dollars. The property of MGM Grand includes five outdoor pools, rivers, and waterfalls as well which cover 6.6 acres of land. There are more than 2,500 machines for gaming as well as 139 poker and table games. Golden Nugget was founded on August 30, 1946, and is owned by Landry's, Inc. This casino has a theme of Goldrush and has a total gaming space of 38,000 square ft. With signature attractions like Gold Nuggets and Shark Tank. The total annual revenue for Golden Nugget is $14.6 million. Tom Breitling and Tim Poster were the highest profile successful entrepreneurs who profited during the crisis. The partners made a profit of $113 million which is called the highest rate of return in such a short time in the gaming industry. Red Rock Casino Resort and Spa was founded on April 18, 2006, and is owned by Station Casinos. This casino has a total gaming space of about 118,309 square ft. And has a theme of Modern/desert. The total revenue of Red Rock casino resort and spa is $1.62 Billion. The resort was topped off in March 2005, before opening on April 18, 2006, as the second casino in Summerlin. Red Rock was Station casinos most expensive property, built at the cost of $925 million. The Cosmopolitan was founded on December 15, 2010, and is owned by The Blackstone Group. This casino has 110,000 square feet of gaming space and has a total revenue of $1.73billion. Stratosphere Casino was founded on April 30, 1996, and is owned by Golden Entertainment. This casino has 80,000 square feet of gaming space, and attractions include Big Shot, Insanity the Ride, etc. Permanent shows include Frankie Moreno. Stratosphere has a total annual amount of $7.4million. Here is the list of owners who owns a casino in Las Vegas. The ambience of the Las Vegas is quite perfect for casinos. The city is best known for the hosting by the casinos. Go through the thorough research provided to you in this article and decide which casino you want to visit.